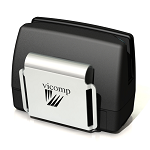 The VPR 460e optical-RFID reader is a specialised device designed to read OCR and RFID information contained in Machine Readable Passports, Visas, ID-cards and other travel documents. It captures machine readable codelines in single hand "swipe" operation and transmits recognised data to a host computer. When not being used reader enters "sleep mode"